The Haffmans CO2-Selector provides an advanced solution for non-invasive CO2 measurement in the filled package. 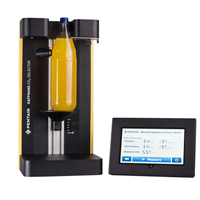 Using an innovative laser technology, the Haffmans CO2-Selector measures the partial CO2 pressure of the headspace, and accurately determines the dissolved CO2 content in the package. Piercing is not required to perform the measurement. The bottle is not destructed and no product is lost. Only a few minutes are required to prepare the package by shaking it to equilibrium and performing the measurement. The procedure is simple and repeatable, which allows for an unlimited number of CO2 measurements to be conducted on the same package.